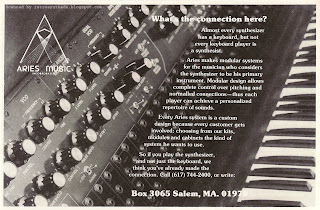 Aries Music Inc. Modular advertisement from page 42 of Synapse Magazine November/December 1977. This second Aries 1/2-page advertisement ran in a couple of Synapse issues starting in November/December, directly following the first 1/2-pager. It was an improvement over that first ad in some ways, and not in others. First, the negative. And it is obvious. White text on a black and white image hardly every works - you really have to darken the image to make it readable. When my eyes glance quickly at this ad, they are immediately drawn to the knobs - not the logo or tag line. Both get lost in a sea of light grays. Aries tries to darken the photo behind the text, but for the most part it fails to make the text readable. And it is a shame that the readability of the ad is compromised because that Aries logo (suspiciously absent in the first Synapse Aries ad) would look gorgeous against a darker background. "Almost every synthesizer has a keyboard, but not every keyboard player is a synthesist. Aries makes modular systems for the musician who considers the synthesizer to be his primary instrument. Modular design allows complete control over pitching and normalled connections - thus each player can achieve a personalized repertoire of sounds. Every Aries system is a custom design because every customer gets involved: choosing from our kits, modules and cabinets the kind of system he wants to use. So if you play the synthesizer, and not just the keyboard, we think you've already made the connection." As you can see, this ad-copy is totally customized for a Synapse audience. Put this advertisement in Contemporary Keyboard magazine and you would only reach a fraction of that magazine's reading audience. But in Synapse, Aries can target with pin-point accuracy someone that is willing to take the time to plan and build their own personal modular synthesizer. That special breed of musician known as a 'synthesist'. Someone like Kevin Kissinger - a musician, composer, and recording artist from Kansas City, Mo. who chose to build his modular from Aries kits. He originally built his Aries modular back in the 70s and has a Web page on his site devoted to his Aries modular. I contacted Kevin to ask him a few questions about his decision to build rather than buy a modular, choosing to go with Aries, and other stuff. Luckily for me, he was quick to reply a nd *very* generous with his answers. As with most musicians, his decision to build a modular back in the 70s started off with a good dose of inspiration. "Since I always admired the work of Wendy Carlos one of my goals was to do 'Switched-on' music on the synthesizer. While the Arp Odyssey, 2600 and Mini-Moogs were great for live performers, I wanted something flexible, expandable, and fully patchable." According to Kevin, cost-savings played a big role in his choice to go with an Aries kit, but that didn't mean that quality and performance features were pushed aside. "The Moog and Arp modulars were too expensive for me and I spread the word among my friends that I wanted to build a synthesizer though I had never tackled such a project before. A friend-of-a-friend gave me a brochure about Paia Electronics. I went as far as to select modules and draw up a mock-up control panel for the instrument. However, I felt the short keyboard would compromise my work, I was uncomfortable with linear tracking VCOs and had heard that the keyboards were hard to calibrate. So, I held back and then the same friend-of-a-friend sent me an Aries brochure. The brochure touted the pure waveforms, the 61-note keyboard, and the use of precision 1% resistors in the keyboard and the VCO's. At the time, Aries did not have a demo recording however I felt confident about building it. 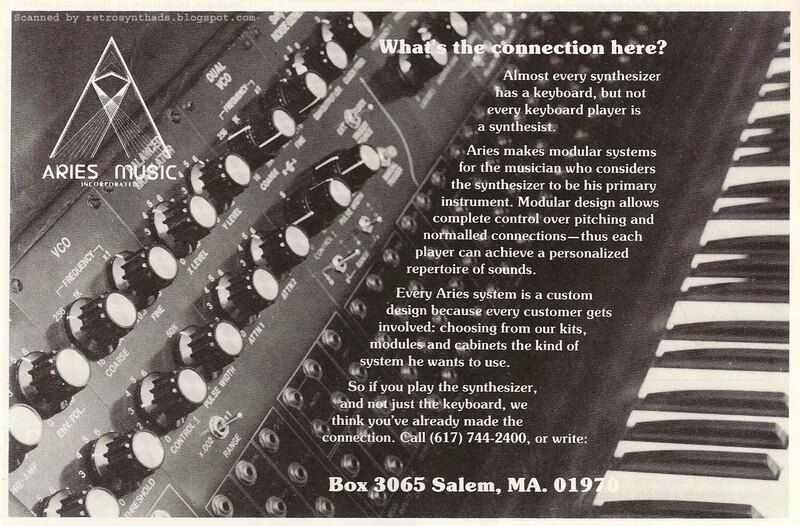 As I recall, the Aries kits were about half the cost of a comparable Moog Modular." Once built, Kevin was definitely impressed with the quality and the sound of Aries, and was able to compare it to other big-name modulars. "After I had built the Aries I had the opportunity to work with a large Moog Modular at the university -- at the time it had probably lost some of its original specs -- it was noisy, the VCO's drifted, and audio and control signals weren't compatible. As wonderful as the big Moog was (and is), it seemed outdated compared to the Aries. What the Moog had that the Aries didn't was a trigger-delay and a fixed-filter bank." Kevin definitely provides a unique historical perspective on Aries - more than any technical reference information you can pull off a piece of paper or Web page. A big thanks to Kevin for taking the time to answer my questions! Check out Kevin's Web site for more information, including recent and upcoming performances.